Clean, simple and wonderful cards! Love your cards. I think they are simple and perfect. Maureen, I love your fun Halloween card! Great colors and fun design! Really nice job on your cards. I like that some was stamped and some raised on both cards. Cute pattern you made with the Halloween stamps. Love your Halloween card is sweet and simple. Both cards are wonderful. The Got Candy set is my absolute favorite and I would love to win. I love your poinsettia card -I mail most of mine and love seeing inspiration that will actually be suitable for mailing. Just gorgeous. 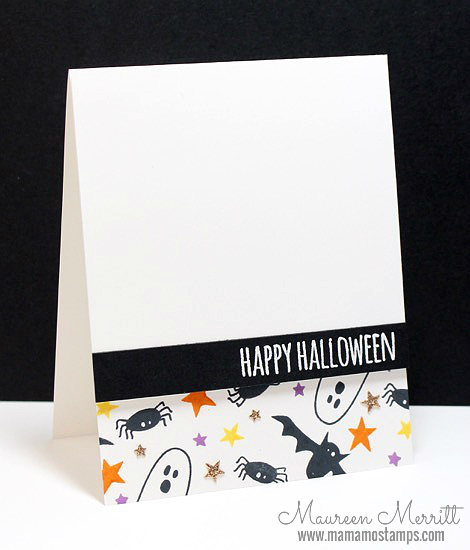 Love the clean and simple look on your Halloween card. Your poinsettia card is really elegant and stunning. Such cute cards! This is a great new release! Very nice cards!! So NOT ready for summer to be over but loving all the wonderful holiday cards!! it's a lovely and beautiful card!!! I'm new to your blog thanks to the hop and look forward to seeing more wonderful work in the future. I love your work. Thanks for inspiring me! Very lovely cards! Stamps w/matching dies are so nice!! Love your cards, simple and beautiful!! Hope to win!!! Cute Halloween card! Gorgeous Christmas card. Sure hope I win as I can't afford to buy all of them. Yummy reveal Ellen! What a wonderful release of stamps and dies, my very favorite is the ELF, not that I won't buy others, but this touches my heart! This is a great Halloween set! Hi there Mama Mo! I can always count on you to bring a Clean And Simple card to the party and you did not disappoint with these two cards. The Poinsettia card is, quite simply, elegant with the gold embossing and a touch of gold sequins to add dimension. The Got Candy? set is adorable, fun and happy and you kept it sweet and simple. Thanks so much for sharing your awesome talent. Pretty cards featuring these awesome new sets! Can't wait to get my hands on them! I love creating cards and ATCs for both Halloween and Christmas... my two fave cardmaking occasions! Love your cards. They look so simple yet so eye catching. The poinsettia card with gold embossing is gorgeous! What lovely cards... i really like the mistletoe and holly card... simple but so effective! Great cards! Love the ghosts and spiders! The Halloween card is so striking with all the white space! Great cards. Great CAS designs. The gold and red poinsettia is gorgeous. Love how clean and simple your designs are on these cards. That really showcases the stamp / dies designs. I especially like the Holloween card....very cute! Love your cards! Love that stamp set. Lovr the clean and simple look of your cards. How cute is your card, Maureen! Great cards. Love the simplicity of them and how they still pop. Thanks for sharing your ideas for using these stamps. OH - so hard to decide which one I like better!! The Halloween card is so cute and whimsical, and the Christmas card is gorgeous with the gold embossing!! Great simple style on both of these beauties! Halloween is my favorite holiday to make cards for. I just love pumpkins. Love your choice of colors and designs. your cards are so simple but gorgeous! I really like your clean and simple designs. The cards are great. I always love seeing your beautiful cards. You do clean-and-simple so well! I know those are the hardest cards to do and you always rock them! My favorite set of the collection is the Mistletoe & Holly, but you made me fall in love with the Got Candy? too!! Your cards are so clean and pretty! Love the candy bottom on the Halloween one! Got Candy is such a cute set. Love your adorable card! The pointsettia card is awesome!! Love the font on this sentiment. I love the upside down ghost peeking out of the card--a very fun Halloween card. I also agree about the fun font of the Merry on the poinsettia card. Thanks for sharing your ideas. Very elegant cards. Thank you for you for sharing. Such a great stamp set' must have, I want to make that card. Making me nervous with the beautiful Christmas card though.thanks for the inspiration. I love your simple but elegant cards! Beautiful cards, Maureen! Love your CAS style! Your cards are wonderful! I am loving this release! So versatile!!! Love your cards! Simply beautiful. Love the halloween card. There is just enough stamping. The Christmas card is wonderful too. The got candy card is adorable, and the poinsettia is gorgeous in that color combo! Awesome, awesome! The Halloween card is just too cute & the poinsettia card is so elegant! The poinsettia card looks so very elegant, i love it. Pick me, pick me!! Such beauty. I love the simplicity of your cards. Absolutely beautiful! Goodness Gracious Sakes Alive! That's what my Gramma used to say. And I have to say it here. That CAS card with the Got Candy set has to be the cutest thing I've ever seen. I would love love love to win it! Thanks, Maureen for the great inspiration. Love the simple beauty of both cards. Very nice! I love all of your cards but your Got Candy card is adorable! I love your CAS style and am always inspired by your cards. Thanks for sharing your creativity! Love your CAS Christmas card! Love these clean and simple style cards - the poinsettia card is just so elegant, and the Halloween one is all kinds of cute. Thanks for sharing your talents with us! Both of these are pretty cool but I really love the card using Mistletoe and Holly!!! LOVE this set!! TFS! 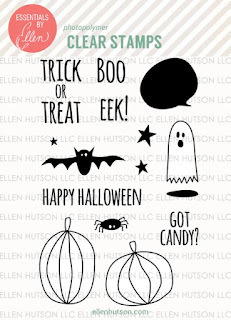 Great idea using the Got candy stamp set for a background. Love it! Clean and simple ~ just my style, Maureen! Your Got Candy card is so cute and love the white embossed sentiment on black card stock. Your red & gold poinsettia is very striking! 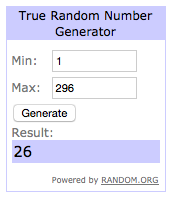 Thanks for the chance to win Got Candy! Love the clean, crispness of both cards! Great layouts! I adore your CAS style, I used to do layered designs for my holiday cards and they were so hard to mail. I now keep them CAS and love your style....a wonderful punch to the design but still easy to mail. Thanks for sharing. Love the clean, simple lines of both cards! Fabulous! Fabulous CAS cards! Love them, TFS! I really like your Halloween card! The Got Candy set is on my wish list. Love the simplicity of your cards. They really pop. Very effective. Thanks for sharing! I love your cards - so elegant! Love the Halloween card, simple but amazing!! Love how creative both of these cards are!! That first one is the bomb dot com!! Thanks for the inspiration. I love the CAS look of these.. Your Halloween one is so cute!!! And the Poinsettia one is very elegant looking! crisp and clean card ...simple yet elegant!